Last week it was my 22nd birthday! 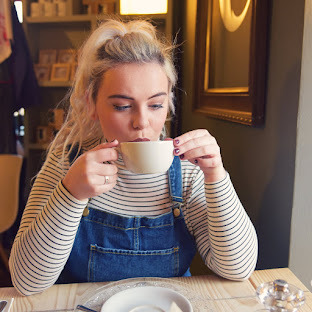 I had a lovely day having Afternoon Tea at the Blagdon Parlour, I also received some gorgeous gifts so don't forget to check out my What I Got For My 22nd Birthday post! My mam was nice enough to make me a gorgeous birthday cake! 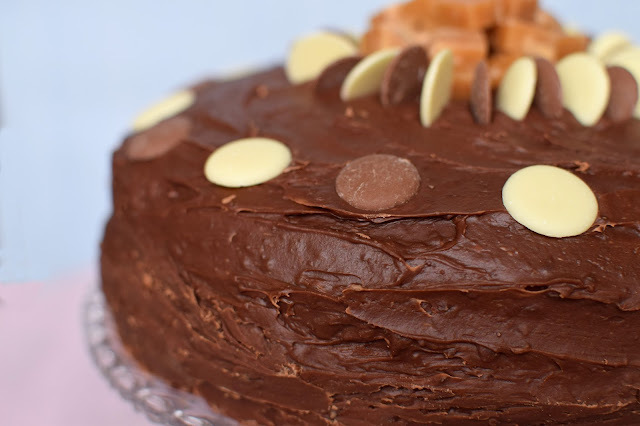 She made a Caramel Cake with Fudge Icing! It was honestly delicious, so I had to share her recipe! 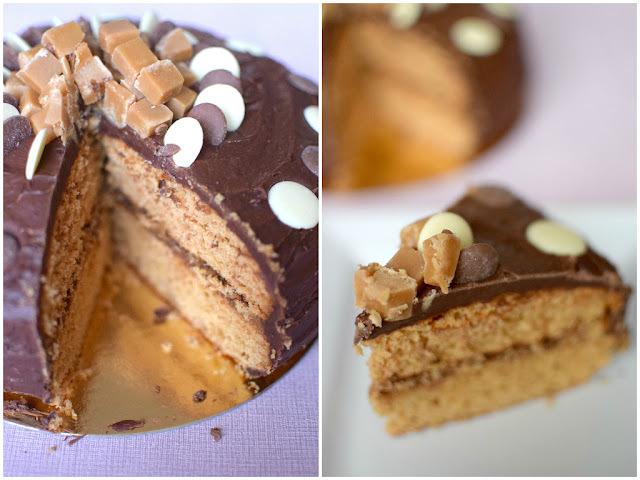 The cake was super moist and well risen, the caramel middle is divine and the icing is so decedent, great for a special occasion! 1. Preheat oven to 200 degrees C/Gas Mark 6. Grease and line two 18cm round sandwich tins. 2. Beat the butter, sugar and caramel together in a large bowl, until light and fluffy. Add vanilla extract and the eggs one at a time, beating after each addition. Add a tablespoon of flour with the final egg. 3. Add the rest of the flour, baking powder and spices and mix thoroughly until combined. Divide the mixture evenly between the tins. 4. Bake the sponges for 25-35 minutes until a skewer inserted in the centre comes out clean. Leave to cool in their tins for 10 mints before turning out onto a wire rack to cool fully. 5. Meanwhile make the fudge icing. Put the evaporated milk and sugar into a saucepan and heat gently to dissolve the sugar. Bring to the boil and simmer for 2-3 minutes without stirring, then remove from the heat. Stir in the chocolate until melted then add the butter to make it glossy. Transfer to a bowl and set aside to cool completely. 6. Once the cakes are cool, spread the remaining caramel over your chosen base cake and top with the next sponge layer. 7. 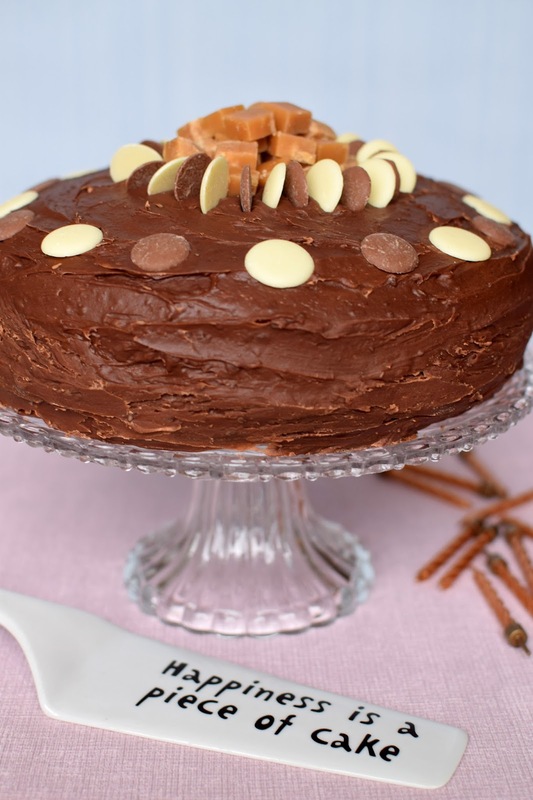 Using a palette knife spread the figs icing over the top and sides of the cake, decorate with your chosen decorations, I scattered chopped salted fudge in the middle and placed chocolate buttons around the centre. This cake looks delicious! I hope you had a nice birthday! It's my little boy's birthday next week and i'm thinking this could be a candidate for his cake!!!! !